Have ample time to decorate, rehearse, have a casual cookout for your wedding party following the rehearsal, and celebrate the big day! 2019 Venue rental $4800 + WV Sales Tax & $500 refundable security deposit. ALL THE EXTRAS ARE INCLUDED! Planning a wedding can be stressful! The Barn on Unity Farm wants to take the stress out of selecting a venue. Most venues charge extra for tables, chairs, linens, and decorations. The Barn on Unity Farm includes all the extra for free AND we give you two full days to decorate (Saturday wedding rental)! 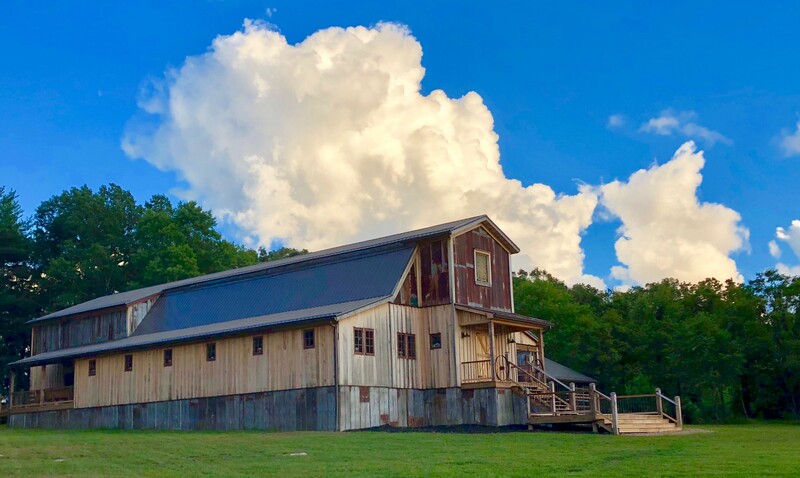 Exclusive access to The Barn on Unity Farm and grounds- more than 100+ acres of rolling hills, open fields, woods, wildlife and streams with many gorgeous sites for outdoor ceremonies including our covered pavilion in case of rain. Temperature controlled wedding barn, ensuring the celebration goes on, despite the weather! Use of our beautiful tables and chairs. Choice of white or ivory linens, table runners along with decoration and props for every style. (We are always adding to our inventory). Bridal Suite with private powder room. Indoor occupancy of 175 (with tables & chairs) and 299 maximum indoor occupancy (chairs only). We offer over flow space for additional guests on our covered patio and covered pavilion adjacent to the barn. Reception area, side patio and pavilion are all areas designed for DJ setup. Secluded location with only a 10 minute drive to local restaurants, hotels and airbnb. Engagement photos scheduled on the grounds for free. Professional venue and individualized service with upfront policies and pricing. Event insurance is required for each rental. Although, we do carry liability insurance for The Barn on Unity Farm, this event insurance protects the client and their guests in case of injury or excess damage to the property. Event insurance typically costs $75 to $150, depending on the number of guests and if you serve alcohol. Most insurance agencies will offer this coverage, and there are online options. (If you need help with securing the event insurance, we are happy to assist you). Method of payment is cash or check. Initial payment of 25% is required to hold your venue date on the calendar. A monthly payment plan will be established at that time. Full payment is due 60 days prior to your scheduled venue date. Proof of event insurance required two weeks prior to your venue date. A refundable $500 security deposit is required two weeks prior to the scheduled venue date. If there are no damages, this will be refunded to you within 30 days after your event. Other venues require that you use their caterer. We want you to be able to select your own licensed caterer and vendors and make your own choices. When not in use for weddings, we are happy to provide pricing and services for other special occasions including corporate events, graduation celebrations, bridal showers, baby showers and reunions. However, these events cannot be scheduled more than 60 days in advance.